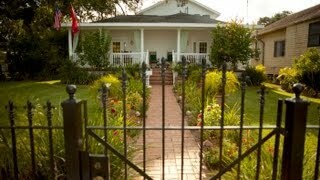 543 Olivier Street has some of the best curb appeal in all of Algiers Point. From the romantic front porch with columns flanked by flowing curtains to the lush landscaping that lines the front walk and perimeter of the yard to the custom wrought iron fence that encloses the double corner lot, it’s a beauty that you’ll be proud to make your own. Enter the double parlors that make up the living and dining rooms, both of which feature wood floors, gorgeous crown molding and ceiling medallions. Morning sun streams onto the front porch that is accessible from both of these rooms and gives you an additional 295 square feet of area to relax and enjoy the gardens. The updated kitchen features stainless steel appliances, granite counters and an attached breakfast room that is large enough to create an office nook as well. French doors lead to a side deck that is easily accessible from the driveway so there’s not far to carry groceries. Just off of the kitchen is a spacious laundry room with a roomy pantry and double doors leading to the back deck. Downstairs also boasts one bedroom and an updated bath with custom walk in shower and furniture quality vanity. Up the shiny staircase, you’ll find 2 more bedrooms and another updated bath, tucked away for privacy. Separate from the main house is a 300 square foot home gym and office, fully equipped with a treadmill, exercise bike, weights, universal gym, storage space, office desk and more. The piece de resistance is the outdoor entertaining area – a 550 square foot deck with hot tub. Included in the purchase is all of the deck furniture, 2 gazebos, bar, grill, chiminea and outdoor rugs and lighting.